If my memory serves me correctly, I have blogged since 2006 when Multiply was a famous platform among bloggers. I didn’t know a lot about blogging back then except writing and posting nearly anything I had wanted to materialize in words. That simple. No blogwalking, no act of promoting my posts in other media. Social network sites weren’t as popular as we know them today. To be frank, I haven’t amassed substantial knowledge on blogging until today that my blog has not exceeded my own expectations. There’re literally ample resources available on the web, but I myself have tended to laze around instead of working on blog optimization. More to the point, I should be committed to updating this blog regularly in order to develop. While things need serious melioration, I have been thrilled to find this blog growing in both traffic and readers. I still am very passionate about blogging as this is now one of source of income to me. WordPress team has always been really helpful and the platform itself offers ease and attractive simplicity. To me blogging serves as an anti-stress therapy while also generating valuable contentment. I can at least name five things I love about blogging. One major effect I have discovered owing to blogging is a continual development of my writing style. I don’t dare call myself a writer in terms of those who are prominent in their work. Still, anyone who produces any written text is technically a writer. As I constantly write online on my blog, I am therefore a writer. Blogging has been a precious experience as it allows me to practice more and more in writing. I have found a significant progress in how to express thoughts in writing which was previously difficult if I haven’t been a blogger myself. In addition to habitual practice, blog posts by other fellow bloggers have contributed to enrich the way I write. Different bloggers demonstrate different styles of writing due to their personal affinity or professional background. Reading other posts do enrich mine. In fact, every post has its own energy to advance my blogging experience. I said earlier that blogging has always been able to canalize stress and abrupt tension in daily life. Writing a post, however trivial it may be, delivers considerable relief. It is even more solacing when what I write has come to readers with beneficial effects. I can’t afford to meet a consultant to whom I can talk freely. Blogging can so far release stress and serve very well in acknowledging my curhats anytime I need to spill them out. One scorching day an email arrived at my box. It was one of my readers who might have chosen to be silent. The guy shares similar experience of an illness I have posted on my blog. The medical condition we were talking about is normally associated with women and both of us are two lucky guys to have them. We finally communicated via WhatsApp Messenger for further talk conveniently. This new friend is a lecturer and has found the symptoms very troubling especially during teaching in the class. The instant urge of micturating resulting from this sickness is nothing but very upsetting. Your focus and concentration on a particular subject is likely corrupted and physical effort is ruined. In some cases, the pain may be so severe that we decide to lie down and rest. He couldn’t hide his mere excitement when meeting a friend to talk to. A little chit-chat has proven effective to relieve our burden of being a man the head of family. I too am very happy to share what I have experienced with the only man suffering from the same condition. Unlike me who is already married, he is currently engaged and going to be married soon. We have become friends ever since. In this regard, I have gained self confidence to be a valuable person. Another reason I love blogging is the rewards I reap from writing contest. Blogging contest is a productive way to practice writing and to gain material profit at the same time. By material I mean valuable products and money as well. Since 2013 I have won a small laptop and five units of smartphone. Blogging competitions have never ceased to exist. One comes when another ends. Oftentimes some big contests are even held nearly simultaneously that requires blogger to set a scale of priority. Priority results in productivity. A friend from Kebumen Central Java won a 10 million rupiah prize last month and another fellow blogger from Surabaya was granted a new Toyota Ayla back in April. Not only does a blogging contest offer amazing prizes but also potential readers or subscribers to our blog. Our participation in a blogging contest normally generate new friendship from other participants from whom we can learn many things. “Salam persohiblogan!” is a popular exclamation to refer to special relationship established among bloggers. The phrase is usually placed in the end of a comment or a post to remind readers that all bloggers are virtually friends. Salam means greeting and persohiblogan signifies Bloggership—that’s the way I put it. Persohiblogan consists of two principal words: sohib (best friend) and blog. The pe – an affix enables the two words to form a single noun—even stronger. This bloggership occurs not only on blog but in social media as well. One of my experience confirms that bloggers are completely friends though they have not had any physical meeting before. Since I am a member of Warung Blogger (literally means blogger stall) on Facebook, I once posted a medical question in the group. Some members of the group immediately responded to my question by suggesting a specific drug name while some others recommended natural medication. I was interested to take both. As for the natural medication (specific type of bark), one of the members offered to send me the bark subsequent to my failure to acquire it in the nearest traditional market. The immense attention simply tells me the power of bloggership. I later realized that blogger is an enigma as well as an anomaly. Most of what they do seem to be opposite to what I see in my everyday life that tends to be egotistic and self-aggrandizement. I have been made ‘apprehensive’ as the actions are against what’s normally happening in the real life. As an anomaly, bloggers develop an existential deviation that penetrates partition and social division of values acclaimed by people of opportunism. It is also prevalent that bloggers help each other when one is afflicted with misfortune. Either it is a permanent sickness or an unexpected calamity, donation and contribution are voluntarily made to alleviate those affected. We have seemed to know each other long enough that the bloggership is cordial and trustful. The beauty of blogging lies in the power of sharing. It is an exceptional quality that we all share in the blogosphere. As a final point, blogging is fundamentally about creating value and benefiting for others. It is not about winning a contest or the prestige of speaking on a prestigious event. It is not about fame when writing a book or profitable popularity as a celeblog. It is what we do that matters—to spread happiness as much as we can. To build progressive community that will be productive in the long run. It is what we believe; it is what we live for. 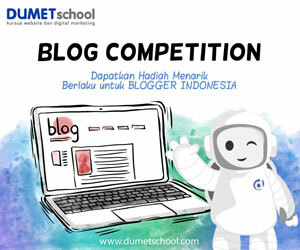 Posted in blogging, digital life, inspirasi, unikTagged alasan ngeblog, asyiknya ngeblog, blogging contest, kenapa ngeblog, manfaat ngeblogBookmark the permalink. Poin 2 dan 5 ngerasain banget … karena bagiku menulis itu seperti rekreaksi jiwa 🙂 — termasuk ngeblog. Jadi ingat sudah berapa banyak buku yang saya peroleh secara cuma-cuma dari kontes di blog (salah satunya dari Bapak pemilik blog ini, hehe). Kerasa banget pernah dapet kiriman pulsa 100 ribu, jaman masih mahasiswa yang notabene duit segitu buat beli pulsa adalah sangat tidak mungkin. Bahkan beberapa orang menghubungi saya secara pribadi untuk “diajak” nulis bareng karena pernah membaca tulisan-tulisan saya di blog. Tapi itu dulu. Hadiah blog sekecil apa pun sangat berarti ya Pu. Yang penting terus menulis. Woow, If only the winners will be selectmed based on randomnly choices, I bet yoYu will become of one of the winners. Walaaa…your written English is something, dear fellow. I am astonishing as well. Btw you didn’t forget to fill in the form and list your link in it, did you. Ok, I wish you luck. I apologize about the typos, my laptop is in a bad mood. I better rewrite in here: Woow, If only the winners will be selected based on randomnly choices, I bet you will become of one of the winners. Walaaa…your written English is something, dear fellow. I am astonishing as well. Btw you didn’t forget to fill in the form and list your link in it, did you. Ok, I wish you luck. No worries, Bunda! Thanks for dropping a comment. When will we enjoy another plate of siomay? Bless you, mate. Keep it up! You know, I keep coming back to this post as I think those 5 things you mentioned could also explain why you blog. And while I’m tempted to think the chief reason is writing, I believe that innately, it’s down to human connection. Specifically, the relationship you have with your readers. McLuhan theorized that “the medium is the message”. And the blog as a medium is based on text. Mainly, longform text that lies outside the scope of the TL:DR crowd, as well as the 10-page academics. Simply, long enough to elucidate, yet compact enough to entertain. So on your end, you write. And on my end, I read. And reading-as Marcel Proust called it, is “that fruitful miracle of a communication in the midst of solitude.” Hence, therein lies the human core: it’s a form of communication-the basis of much of our relationships! You forthrightly mentioned facets of it at numbers 3 and 5. Thus, while the majority of the things you like about blogging are internal, I believe that they eventually feed into the external: other people. Perhaps you readers read your posts and sigh. Perhaps they comment. Perhaps they subscribe, look at the title of your post and scrolled on. But the point remains, that you have communicated your thoughts into the vast unknown-which can sometimes feel like a void. In any case, I believe you’ve successfully communicated yourself to me. And it affected me (yes, the root of it is affect, as your writing did trigger an emotional response in me) in such a way that spurred me to write this comment at the Barnes & Noble Cafe on Niagara Falls Boulevard. Hurrah to you, mate! When it comes to English posts, your comment is worth a blog post, haha. But I enjoy reading every comment of yours. Your syntactical construction and vocabs provide me with valuable insights, really. I hope to sit and sip a cup of coffee at the Barnes & Noble Cafe where we can have a chit-chat. Btw, when you mentioned Barnes & Noble, that prompts me to Bob Woodward’s ‘Fear’ which is said to be the fastest selling book today. Have you read the book? In any case, keep it up, Mate! I love history, too. Right on!